Dipali (Babita) is a beauty contestant from Delhi. In the aftermath of her (unexpected) loss, she is consoled by Ajit (Prem Chopra), a smooth-talking con man only interested in the fortune that she will inherit from her late industrialist father. She returns home after exchanging vows of undying devotion with him. When she tells Ajit that she is pregnant with his child, he pushes her off a cliff. 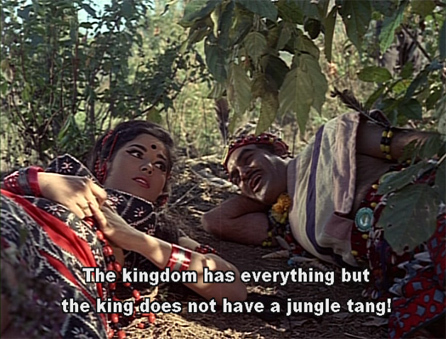 Luckily for her, three friends—Pritam (Shashi Kapoor), Ram (Rajendranath) and Sudhir (Sudhir)—are hunting in the forest nearby and find her, battered and unconscious. 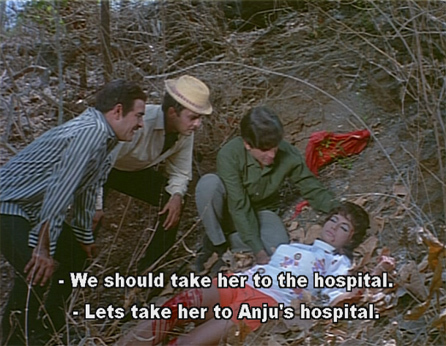 They take her to the hospital where Sudhir’s girlfriend Anju is a nurse. There we are treated to some heavy-handed foreshadowing: Dr. Rama (Kamini Kaushal), the head of the hospital (and Anju’s aunt) seems to recognize Pritam, and has a photo album filled with pictures of him. We also discover that Pritam and Ram are going off to Delhi for a hunting expedition. I love Om Prakash. Anyway, they decide they don’t like Ajit, and nothing Dipali says can sway them from this conviction. Meanwhile, Pritam and Ram have arrived in town, and have rented the house next door. 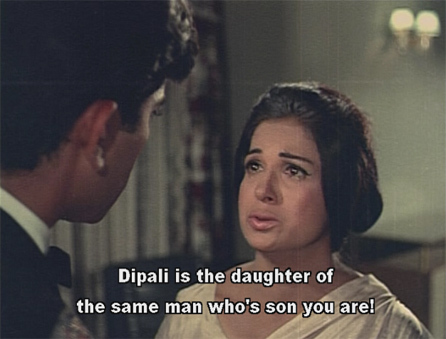 When Dipali and her uncle learn that a person from Bombay has moved in, they assume that it must be Ajit. 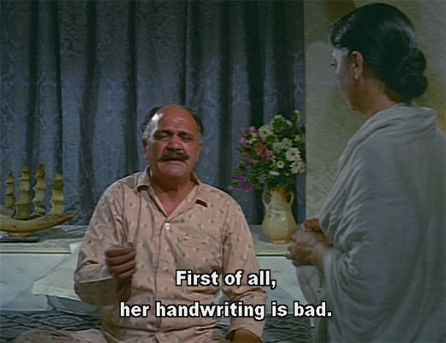 Chowdhury threatens poor Pritam, who has no idea what he’s talking about; and Dipali writes him a loving note. He meets her at a park, in accordance with her instructions, and falls instantly in love with her. She is unimpressed. Perhaps her electric blue eyeshadow has gotten into her eyes. Pritam sets out to charm her and Chowdhury, succeeding quickly with Chowdhury (he IS Shashi after all), but meeting resistance from Dipali. She is convinced she loves Ajit. 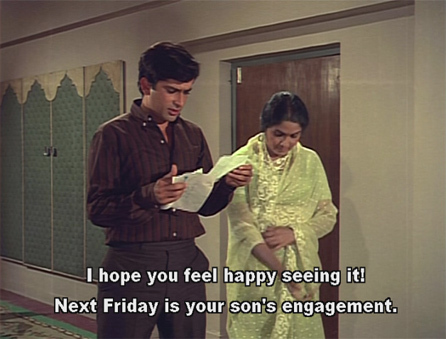 Strangely, so is Sherry, whom Ajit visits in the hospital. She has forgiven him (WTF? he pushed you off a cliff!) and he promises to marry her when he’s made lots of money on a “business deal” in Delhi. A business deal named Dipali! It’s very odd to see Helen in Bhartiya Naari mode. I must say, the dialogues thus far have been quite hilarious. It’s an extremely silly movie and I’m enjoying it hugely. When Pritam shoots a tiger about to attack Dipali, her attitude towards him thaws a little—but they return home to a letter from Ajit: he is coming to visit her. When Ajit arrives in Delhi, Pritam and Chowdhury conspire together to reveal his true nature, and he is sent packing. Dipali finally realizes her folly, and confesses her love for Pritam. They are engaged and all is well! End of Silly Film. Cue Melodrama. In Bombay, Pritam’s mother Kaushalya (Sulochana) meets with Dr. Rama to tell her that Pritam is getting married, and it becomes clear that Dr. Rama is actually Pritam’s real mother. Their conversation is interrupted by a call from another doctor, asking Rama to go to Sudhir’s house. There, tragedy has struck. Sudhir asks Rama to help him convince his girlfriend Anju (her niece, if you recall) that he doesn’t love her any more; he wants to spare her the burden of a blind husband (without consulting her about it at all). Rama reluctantly agrees. Anju, heartbroken, writes to Pritam to tell him of Sudhir’s inexplicable rejection, and asks him to intervene for her. Pritam comes back to Bombay. 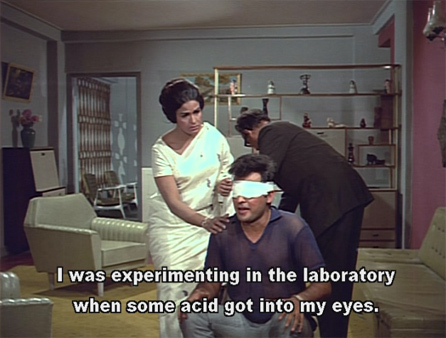 He and Anju confront Sudhir, who cleverly conceals his blindness. Pritam becomes angry with him and slaps him. He takes Anju back to the car, realizes he’s left his keys behind, and goes back up to Sudhir’s house—only to find him on his hands and knees searching for matches he has dropped. This naturally puts Pritam through an emotional wringer. 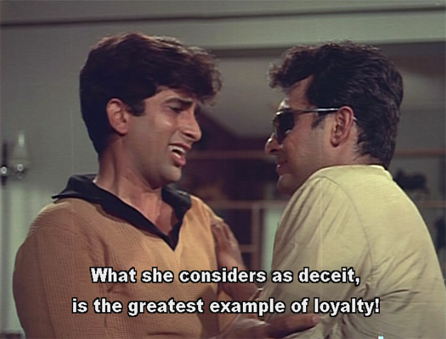 Sudhir asks him to help him deceive Anju and he agrees willingly. As some of you already know, I can’t really get on board with that, but by now I’m well and truly ensnared by this loopy film. At home, Kaushalya has taken Pritam’s photo of Dipali and is sending it to Rama with a note. Pritam accidentally reads the note. Stunned, Pritam goes to Rama for an explanation. She tells him that she married his father in England while in medical school. His father returned to India first without her; she finished her education a few months later and then also returned. In India, she discovered that her husband had already been married when he “married” her, and had gone back to his first wife. When he rejected her, Rama had no choice but to give up her child to be raised by her best friend. She and Pritam tearfully reunite, and Pritam is glad to have two mothers. The ensuing drama puts every soap opera—in every language, ever made, all put together—in its shade. Don’t miss it to find out what happens next! Posted on June 8, 2008 at 2:53 pm in Excellent Use of Helen, Hindi movies	| RSS feed You can skip to the end and leave a reply. And Om Prakash! Awww. I LOVE him! 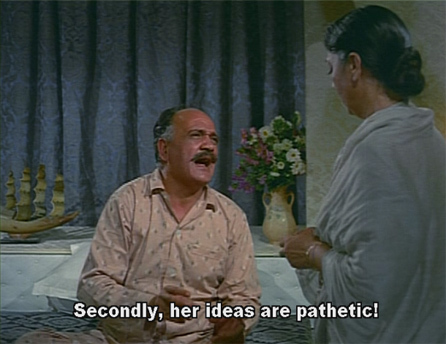 If this movie also had Pran in it, I would probably explode. No Pran, but plenty of other lunacy! It’s like two different movies that have been grafted together and (mostly) have the same people in it. I love Om Prakash too. And if you refer to the 2003 Chori Chori (which I somehow doubt) it is my favorite film ever (Raj Kapoor’s Chori Chori not so much, although I didn’t hate it as much as many of his other films). Love this movie, though I am not sure if its because its silliness or inspite of it! Babita is rightly torn between Pem Chopra and Shashi – they are both so good looking here. 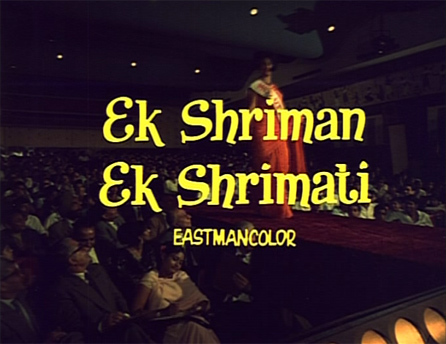 :-) And the songs are FUN – I loved ‘Aaye baithe khaaye piye khiske’ (similar in style to ‘O dilbar jaaniye’ of Haseena Maan Jayegi, at least in Shashi’s acrobatics!) ‘Chup rahe to khafaa’ and ‘Ho gaya ho gaya’. Om Prakash is soooo funny when he comments on Deepali’s love letter, and when it comes to “shikaar” (hunting)!!! I really need to get Haseena Maan Jayegi, and pronto. It’s nice to see that the plot device that sent people through the roof about Kal Ho Naa Ho has precedence in Bollywood. ;-) This movie looks hilarious. And I just moved Chori Chori (2003) to the top of my queue! Aww, Memsaab, you know I meant the Raj Kapoor/Nargis Chori Chori. It looks like I’m turning into the resident Raj apologist – but it’s SO GOOD. Who’s in the 2003 one? ajnabi—ooh! Do let me know how you like it! It’s so lovely. ppcc: of course I knew you meant RKs; and someone has to be an apologist for him, might as well be you :-) He would be happy to know it! I do love films from the 60s. I suspect your review is funnier than the film. But must, must watch. 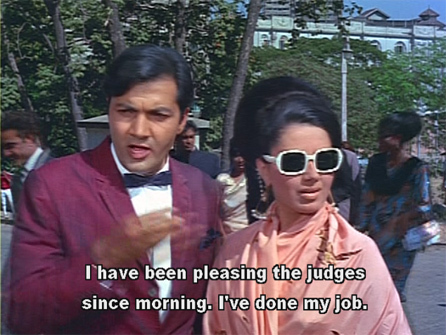 Babita was a gorgeous dresser, wasn’t she, despite her blue eyeshadow and pink cheeks. Banno, the dialogues in the first half (at least as subtitled) are pretty funny (on purpose)…not so much when it turns to melodrama (but then it’s just so OTT that it’s funny). Babita DID have gorgeous clothes, although I can’t think of her as pretty; Karisma looks so much like her that it’s uncanny though! 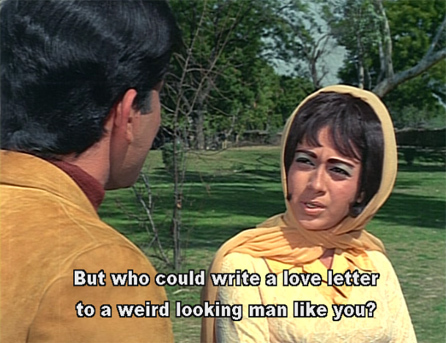 Also, I liked the Rani/Ajay “Chori Chori.” It’s not the best movie ever made, but it’s very cute. Ajay is hilarious as the relectant romantic hero who is steamrolled by Rani in super-hyper-mode. How could you all even sit through it in one go??? Its soooo excrutiatingly painfully OTT! This is really my favorite era, although I love the OTT 70’s too of course. The songs and the silly love stories are just such heavenly entertainment! Babita could be pretty sometimes, but yes, hard to see any resemblance to Sadhana although both had a great sense of style. I didn’t care for this movie although I watched it to the end. 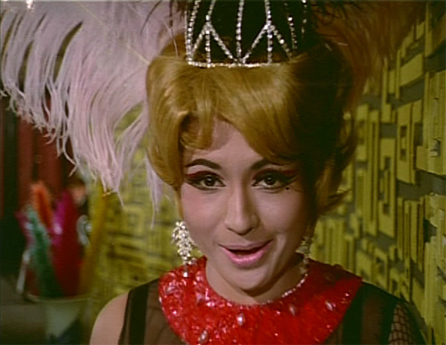 Plus points were the soundtrack which boasts popular songs of that time and babita looks very pretty. 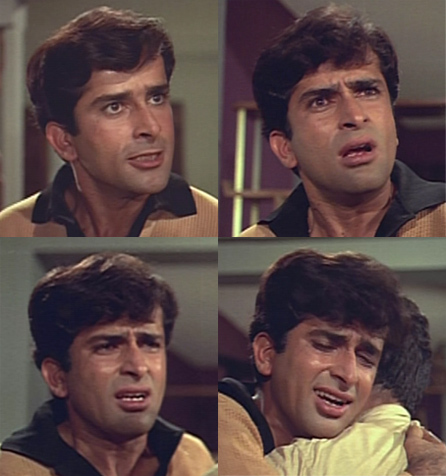 I find shashi trying to imitate shammi in this movie and he does a bad job.